I was watching Morgan Freeman last night on Oprah’s Master Class episode and realized that life IS what happens to you while you are busy making plans. And if you pay attention to life, your dreams are more likely to come true. He wanted to be an actor from when he was a young child and he stayed focused and listened for the signs in life that helped him become who he is today. 2) Identify something everyday to work towards your dream–and pay attention to the signs along the way. What are they telling you? 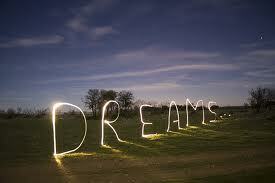 4) Remind yourself that dreams change forms along the way. You can’t be too overly specific while searching. Better said, if you are overly specific, at least be flexible to providence and the willingness to alter as life happens. My sister wanted to give back to the world and help people feel better about themselves. She is now a Pilates instructor helping many people not only become fit and healthy but using this as physical therapy for those that need it. She loves it! Being a Pilates instructor wasn’t specifically her dream. She took risks along the way, did many things that related to giving back and, now at the age of 49 is one of the most well known Pilates instructors in Spain. 5) Be patient, persistent, courageous and committed. Without these things….your providence has the chance of prospering as much as winning the lottery. FYI–Morgan Freeman became an ACTOR, from his description at the age of 50.